Vern was born in Ogden and his grandma used to bring him to the Union Station because it had so much to offer a young man. Vern could relate to the railroad with all its big trains, and museum because his granddad used to work as a machinist for the Southern Pacific. Vern remembers bringing his kids to the station in 2004 just to do what his grandma used to do. He and the kids were admiring #223 when Maynard Morris collared him with an offer of volunteering. Vern had used his hands in heavy labor all his life and the idea of using his welding and engine expertise as a volunteer was enticing. He had worked loading railroad grain cars, construction jobs and is currently working welding utility trailers. Vern’s first assignment in the #223 shop as part of the restoration team was to drill holes in the new tender for hot rivets. Vern now brings his kids to the shop to keep them up to date on the restoration progress. 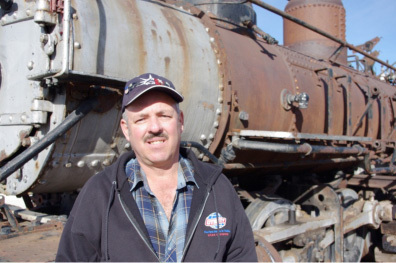 He hopes to instill a kindness for, if not a passion in the kid’s hearts for railroading. He believes that teaching his kids how to use their hands to make “stuff” is vitally important to their future.